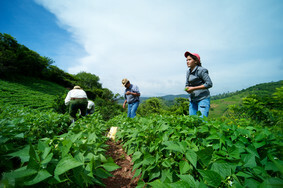 succession, the meetings of the G8, G20 and the Rio +20 conference offer a unique opportunity to capitalise on the growing recognition that agricultural development is the key to a sustainable future. Small farmers not only need to be a focus of any new agreements; they need to have a role in framing them. percent of the world’s poorest people living in the rural areas of developing countries, whether we succeed or fail in our efforts to feed the world and rid it of poverty will largely depend on reaching the people who work the world’s 500 million small farms, many of whom are women. No new agricultural agenda can ignore the importance of empowering women. In developing countries, 43% of the farmers are women, yet their performance is hampered by deeply unequal access to services and resources - such as credit, extension and improved seeds and fertiliser. And more importantly, they often do not have title rights to the land they farm. It has been estimated that if women had the same access to resources as men, they could increase yields on their farms by 20–30%. Closing this gender gap would lift 150 million people out of hunger. To transform our lives we need modern equipment, water, electricity, telephone… and why not internet? degraded, and a population that is expected to top 9 billion people by 2050, what we need now is not ‘more of the same’. In moving ahead, we have to make sure we are not looking backward. sustainable agricultural intensification agenda that can deliver not only greater productivity but also greater sustainability, resilience to shocks, decent incomes and jobs - particularly for rural youth - and greater nutritional value. providers of on-farm private investment is recognised and supported first and foremost. We will also need to ensure that interventions reach deep into rural areas. The benefits of research, such as improved seeds and drought-tolerant varieties, as well as market information and technologies, will need to be available on the most modest farm in the most remote location. perspective is critical. During a recent visit to Cameroon, one young farmer, Susanne Nke, told me that “The rural women of our villages must really reach full autonomy. The arduous nature of their work must be reduced. We want to move from the hoe to the tractor. social transformation. And clearly, agricultural development means building strong communities as well as livelihoods. no matter how small, is a business. And smallholder farmers are themselves the biggest investors in agriculture in developing countries. are typically the most direct providers of food security at the household level. of scale and, perhaps most importantly, to strengthen their bargaining power in the value chain, often dominated by powerful private-sector actors. Gender equality is important here as well, in the composition of farmers’ organisations and women farmers’ own ability to organise effectively. Recognising small farmers and their organizations as primary stakeholders in development means more than paying lip service to them in global meetings. Truly acting upon this recognition requires genuine collaboration and inclusive processes, which cannot be an afterthought but need to start from the very design of programmes and continue through to evaluation. 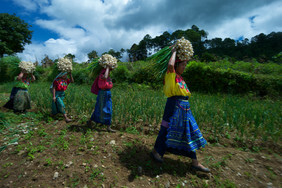 In Guatemala, an IFAD supported project has helped a producers’ association in El Quiché buy irrigation equipment, build a new storage facility and work with the private sector to bring their produce to new markets. By engaging with private sector partners, they have seen a three-fold increase in productivity, and today these farmers sell to some of the biggest retailers in the world, including retailers in the United States. There is no single solution that will allow small farmers to respond to the various challenges they face. But our experience has shown that targeted interventions that address the particular spectrum of issues faced by rural communities and that give smallholders a stake in the process are the most practical and cost-effective way to further agricultural development and improve the lives of rural people. 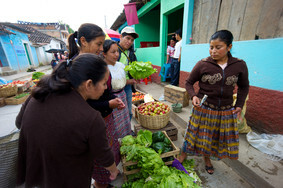 The power of smallholders in ensuring food security and eradicating poverty is a reality that world leaders in Camp David, Mexico City and Rio cannot afford to ignore.